ISLN - Singapore: Red Dot Voting -- has begun! Red Dot Voting -- has begun! March 1 through May 1 is the voting season -- for each school to decide which book in each of the four Red Dot reader categories is the winner for them..... and then we tally all the votes to say which book wins for all of Singapore. 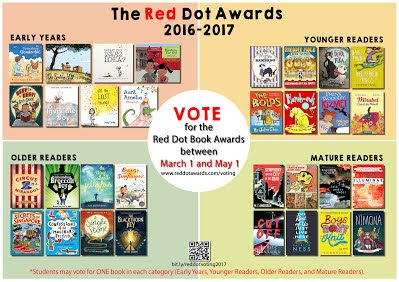 As the Red Dots are a "children's choice" award (after we librarians have come up with the shortlists), only students may vote. And the rule is one vote per student per category (Early Years, Younger Readers, Older Readers, and Mature Readers). Simply one vote per student per category. One week later the Singapore-wide winners will be announced on the Red Dot website.